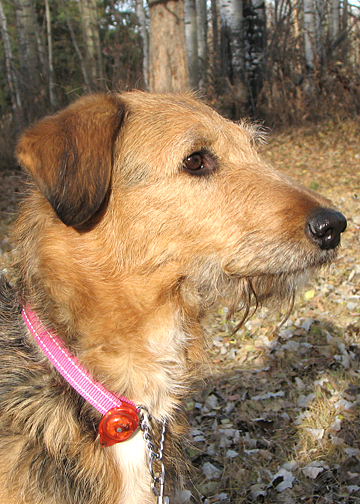 Finesse is a lovable, energetic mix. She’s approximately 1.5 years. We believe she’s most likely part Greyhound. She’s graceful, leggy and probably very fast! 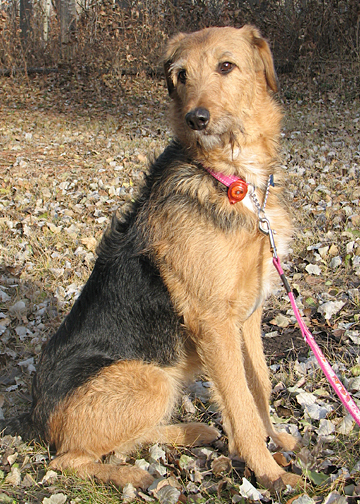 Finnie is affectionate, loves to cuddle and loves to play with her ball. She has some obedience training but would require a bit more work on heeling. She would certainly benefit from an obedience class. She gets excited when she sees another dog and pulls, but over all she’s a great walking or running companion and could probably be trained to bike as well. With her elegant, long legs, she no doubt enjoys using them. An active home would be best for our Finnie! This doesn’t mean that she doesn’t know how to relax though. Finnie is quiet in the house, is happy to nap on her dog bed (Or curl up on the couch with you to watch tv) and sleeps quietly through the night uncrated. She is crate trained and is fairly quiet when crated (maybe a whimper or two). The most noise she makes in the crate is when she wags her tail and thumps loudly on the sides of the crate. We do not know her history, so we would prefer she go to a home with some experience, and preferrably no small children in the house. This is ONLY because we do not know her background. A high fenced yard is ideal. She CAN jump! In fact, if anyone has some aspirations of participating in agility, Finesse might be a great candidate for that. She will require training to bring up her ball drive although she does work quite well for food. Finnie is NOT a cat person…er…dog. So a cat free home is a must. We feel that she has a pretty high prey drive, so squirrels, look out! She’s can be a bit dominant, but so far she gets along with every dog she’s met, male or female. Finesse is in the Edmonton, Alberta area and we would prefer placement in this region if at all possible. Finesse will be spayed before placement.